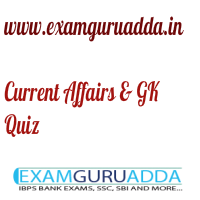 Dear Readers Examguruadda.in presents Current Affairs quiz of 27-28th December 2016 that cover important current affair events. Current Affairs quiz for IBPS PO,clerk, RRB-Po,Clerk, SBI, NIACL,Railways and SSC Exams. 1. Nedumkayam, which has become the India’s first cashless and digital tribal colony, is in which state/union territory? 2. The 77th session of Indian History Congress (IHC) has started in which state of India? 3. Which state will host the 2022 National Games? 4. “Atal Amrit Abhiyan” a health insurance scheme has been launched by which state government of India? 5. Which country has successfully tested its 5th generation stealth fighter jet “FC-31 Gyrfalcon”? 6. “Bank Sakhi” scheme has been launched by which grameen bank of India? 7. Who has been chosen for 2016 Bihari Puraskar? 8. The book “I am a troll” has been authored by whom? 9. The book “Emperor Chandragupta” has been authored by whom? 10. Who is the newly appointed Director General of National Cadet Corps (NCC)?